This Barley, Apple, Feta and Pomegranate Salad is the epitome of a Mama's lunch. It can be thrnow together quickly, keeps well for a good long while, and can be eaten straight from fridge or at room temperature - you know, in case you get pulled away from it by a work phone call or a crying toddler. Ok, so maybe you're not a Mama - but you are a busy working gal or guy and having a healthy lunch during the work week is a challenge. This Barley, Apple, Feta, and Pomegranate salad is for you too. 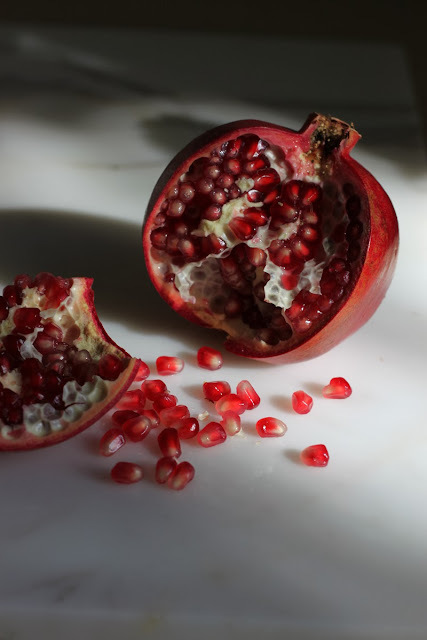 Here's what you need to know about Pomegranates: You'll see pomegranates in your local market between now and January. Choose a pome that has clear tight skin and is heavy for its size. Pomegranate will last longest in your fridge or other cool dry place. Those seed-like kernels inside the fruit are called arils. Getting to the arils can be a little tricky. I like to score the skin of a pomegranate like I'm cutting it in quarters. Then, over a bowl of water set inside the sink, pry the pome into quarters. Doing this in the sink keeps the colorful juices from spraying all over your kitchen. Use your fingers to gently scoot the arils out of the flesh and into the water. The bowl of water will separate the white pith from the fruity arils. When you've cleaned all four quarters of arils, scoop the floating pith away from the water and drain your arils. Store the arils in an airtight container for up to a week. 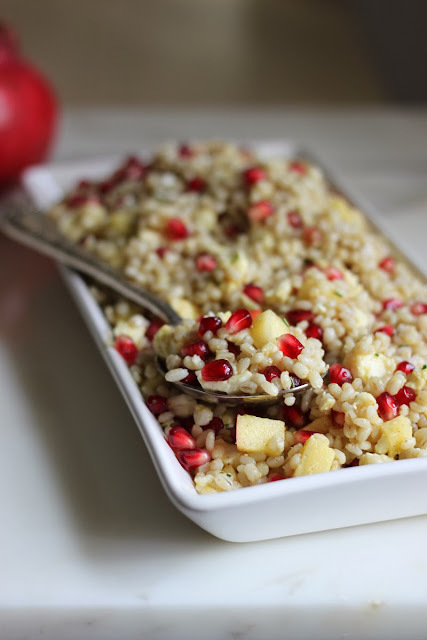 The pomegranate arils add a sweet-juicy-crunch to this grain salad. The key to a grain salad that can survive a week in your fridge is a really great dressing. Lately, I've been wondering "Why isn't Maple Mustard a thing?". Yes, these are the things I wonder about and, yes, I think its we should make Maple Mustard a thing. 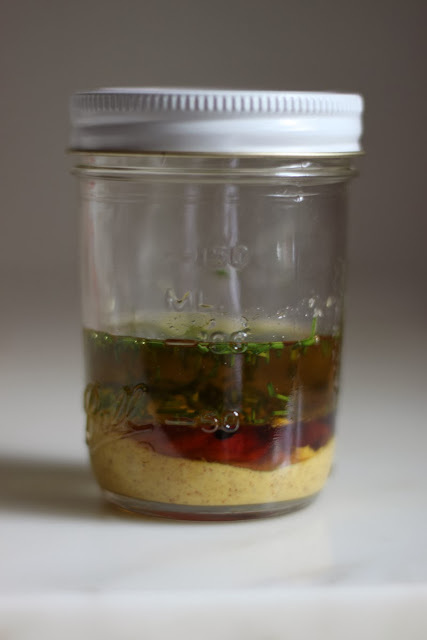 In the mean time we have this mustard meets maple vinaigrette to tide us over. And it is the key to this seemingly simple salad. This salad keeps incredibly well! I prefer to eat to at room temperature, but straight out of the fridge is delicious, too. It would also be a great dish to bring to a Thanksgiving dinner! 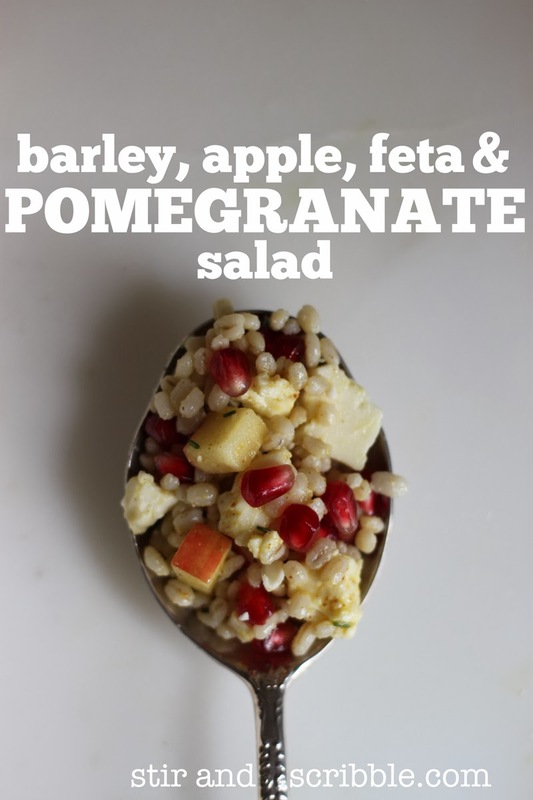 Toss together the barley, pomegranate arils, feta cheese, and apple in a large bowl. Combine the mustard, olive oil, apple cider vinegar, herbs, maple syrup and salt in a small jar. Lid the jar and shake to combine. Pour this dressing over the barley mixture and stir to coat. The salad should sit at room temperature for about 30 minutes before serving. So, I want to make this now. It looks and sounds amazing! Let's say I don't have barley…could I use something else? Quinoa? Totally - I'd suggest brown rice, quinoa, or faro. You might want slightly less quinoa (the grains are smaller). Let me know what you try! Thanks Vett! And thanks for reading. Ooh, I love this recipe, it looks so delicious! I've seen pomegranate this week when I was doing my groceries, but didn't take one with me. I'm glad I didn't, because now I know what I have to pay attention to when buying one and how to handle them. Thanks a lot. I'm definitely going to make something similar with pomegranate very soon. I love feta too and I think I'm going to add some nuts as well. Hey Sofie! Thanks. I totally have picked up some less than stellar pomegranates before doing all my research. Nothing worse than opening on up and having it be under ripe or brown! I am totally trying this. Sounds so good! Thanks Anna - I know a busy Mama like you could use a recipe like this!